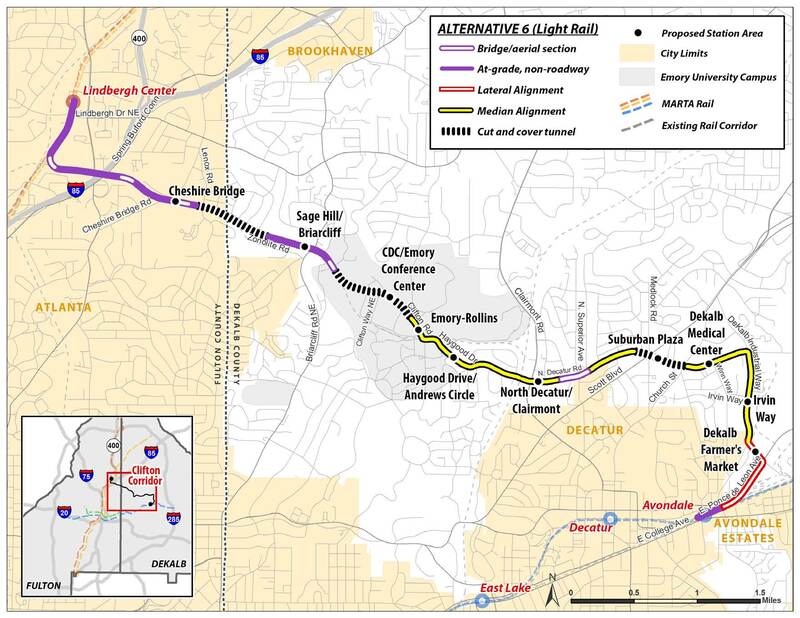 The AJC reports that the new MARTA lines will include the so-called Clifton Corridor, linking the Avondale station east of Decatur with the Lindbergh Center station in north Atlanta. It would provide relief to one of metro Atlanta's more congested areas, creating MARTA rail service to Emory Univeristy, Emory Hospital, the Centers for Disease Control and Prevention, Children's Healthcare and the Veteran's Administration Hospital near Decatur. The four-mile Clifton Corridor light rail line from MARTA’s Lindbergh station to the Emory University/Centers for Disease Control and Prevention area recently annexed by Atlanta. A light rail system stretching from the Clifton Corridor to Campbelltown Road in southwest Atlanta. 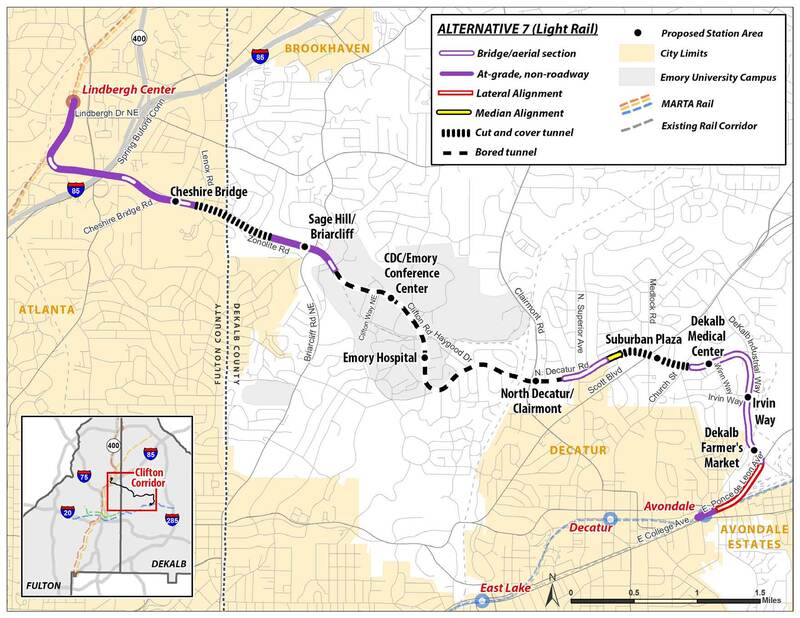 The network includes the northeast and southwest portions of the proposed Beltline Loop, plus a connecting link through downtown along the existing Atlanta Streetcar route. The streetcar would become part of the light rail network. Bus rapid transit lines on Capitol Avenue, North Avenue and Northside Drive. MARTA also would initially deploy bus rapid transit along Campbellton Road before upgrading the line to light rail. The buses may operate in their own lanes, making the service faster than local bus service. Three arterial rapid transit bus lines, which would operate in regular traffic but may get priority at traffic signals and other enhancements to keep them moving. Last edited by fieldm; 05-11-2018 at 09:35 PM.. I wonder if Ryan Gravel is ever going be like, "screw all of you!" and move away from Atlanta. I disagree with Gravel about completing loop over Clifton lightrail. Emory students are disconnected from Atlanta and most don't have a car, this would help them access the city. It would also create an option to alleviate traffic in such a horrible congested area for all of the employees (Emory, VA, CDC). If we are going to cut lightrail from somewhere to complete the beltline loop, it should be all of the SW lightrail. That area really isn't that dense and they already have pretty good heavy rail access there. I wonder which version is better for the CC. Alternative 1 or 2? I prefer Alternate 1. It puts a stop right at the hospital, which provides access both to employment and healthcare. Good for everyone to have as many healthcare facilities accessible by transit as possible. The upside of Alternate 2 is that it puts a stop closer to the VA hospital, but I don’t think they serve nearly as many people, and a circulator shuttle would be easy enough, especially if they could run to through Emory’s park to Claremont like the Emory shuttles do. I agree with this. We should complete the loop AND Clifton. As for Campbellton Rd in the SW, it can wait or just stick with BRT. I think that one is the mayor's idea because she really cares about that area. Agreed. Campbellton Rd is not a good candidate for light rail, the population density is WAY too low, especially as you get further out. There is no need for a transit alternative that carries such a large number of people. However, that area would be great for a BRT route. There are likely a lot of people that would use it, and if it is in its own lane, it will move just as fast as light rail. The streetcars need to stick to the crosstown midtown/downtown lines and the beltline right now. Obviously, a light rail route is needed out to the Emory/CDC area. However, I will say it peeves me a bit that we voted for this before Emory was a part of the CoA, and they annexed specifically to get rail once the TSPLOST passed. That money could be well-spent in the rest of the CoA. My preference is definitely 7 as all but a few hundred feet are elevated, underground, or just not on a road. Same here. Deal with car traffic as little as possible, please. If he does, so be it. He's coming off like a petulant child here. If anyone was shortchanged, it was the Clifton Corridor. They were slated for HRT in MARTA's original plan, but the plan was kiboshed in favor of Bankhead (still IMO a pretty shortsighted move). Rail will come to encircle the Beltline, I believe; just not right away. Rome wasn't built in a day, Ryan.